Has it come to this? Are we now so caught in the paralyzing nostalgia of the past that we only have the capacity to replicate it scene-by-scene? I am reminded of the vastly differing perspectives of the Disney animators of the 90s and the great Jean Cocteau, who made the first great film interpretation of this story at a time when fairy tales ebbed higher in the suspicious eyes of artists. His was a technical triumph that looked askance at details rather than with loving wonder; to him it was not so much about whether a beautiful woman could undo the curse on a horrendous beast, but about the startling discoveries that lurked in his enigma of a castle. As ages have passed and trends have simplified, that old relic remains a strange and enchanting treasure worth revisiting. I bring this up not to diminish the cartoon version – which is riveting in its own right – but to contrast what this story means to us as it falls into different hands over time. Between both films was a cultural shift that recognized famous yarns as enduring experiences, with each new generation of viewers being drawn to a different facet of the premise. A fresh sensibility drove the animators to make a movie that existed in no other shadows but its own. But now we are burdened with a remake that has almost nothing going for it, save for a few isolated moments of elegant production design and effective dialogue exchanges between the leads; nearly every detail otherwise is lifted verbatim from the earlier picture, minus the finesse or joy. This is not a movie at all, it’s an overzealous dress rehearsal. The first sign of this distinction comes in the prologue, containing a voiceover that sounds all-too-familiar amidst flashbacks that seem rushed and haphazard. A recap: a prince in a far-off French castle has been punished for his selfish ways by a beautiful enchantress after he refused her shelter, deceived by her appearance as an old hag stumbling through the darkness. The curse he owns has turned him into a grotesque beast and made all his servants objects to furnish the castle, including a clock who was once an adviser (Ian McKellen) and a teapot who was once the cook (Emma Thompson). Legend suggests, at least, that the transformation is not permanent… provided that the prince learns to soften his gruff exterior and earn the love of a maiden well before the enchanted rose in his castle ceases blooming and all the petals fall off. Is that at all possible, though, given his horrific appearance? The greater challenge, I would suspect, comes down to a detail that goes otherwise ignored: how do you encourage anyone to come to your castle when you’re trapped in an eternal winter and no one in the neighboring villages remembers there even being a castle to begin with? The solution to that dilemma is Belle, played here by Emma Watson, in a role that traps her in the laziness of a conventional heroine. She is the newest resident to a small little town in the French countryside, where everyone gossips, women have no use for books and the most popular person is an arrogant hunter named Gaston (Luke Evans), who imagines making Belle his devoted wife. Unfortunately, she prefers dreamers over self-absorbed egomaniacs, inevitably relegating him to a two-hour routine of coming up with one scheme after another in an attempt to woo her – including accusing her father (Kevin Kline) of making up a story about a horrific beast in the woods to get him committed to an asylum unless she agrees to marriage. Among a cluster of ordinary characterizations that move this story towards all its conventional twists, only his loyal sidekick LeFou (Josh Gad) seems to function with some level of identity; he is not a duplicate of the animated version, and Gad has a lot of fun with underlying behaviors, including a few astute observations and some affectionate glances that imply romantic desires towards his close comrade (foolishly, the conservative media took odds with this portrayal because, I guess, they were offended by the idea of gays existing in a fairy tale). If I am keeping a discussion about the beast and his supporting cast at a distance, its because they represent some of the more depressing changes between the animated and the live action versions. The likes of Lumiere, Cogsworth and Mrs. Potts stick fresh in the memory from their early incarnations not just because they were voiced with robust enthusiasm, but because the character designs were apt for their surroundings. They legitimately fit the aesthetic of their film. But what the visual effects supervisors have come up with here are disjointed and creepy-looking renditions that have no place in any movie, least of all one aimed at younger audiences. The talking candlestick, for example, with his weird little face shoved between two arms on a curved surface, is grotesque – after uttering two lines I was convinced, for a brief moment, that I was not actually watching a movie, but feeling trapped in a very vivid nightmare. 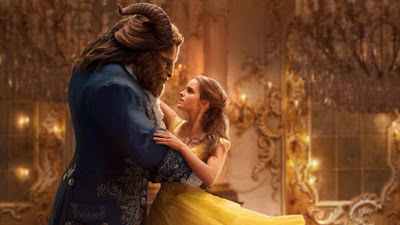 The beast played Dan Stevens is less offensive, although only slightly; the amount of hair motion capture done on his face so thoroughly obscures his ability to emote that he seems paralyzed, and that undermines some of the key exchanges early on when neither he nor Belle are supposed to get along. On the other hand, the exchanges between Stevens and Watson are the movie’s core selling point. They have chemistry. There is a great little scene in the second act where both are sharing personal stories while walking the grounds of the castle, and there is a brief glimmer of optimism – in that moment, they are characters exchanging interests, growing to respect and admire one another naturally rather than for the conventions of their screenplay. Meanwhile, the castle they spend their time in is a triumph of production design, with all its curved corridors and towering windows looking out on elegant gardens that seem crafted by magic rather than the hands of architects. Those values play as such a stark contrast to what comes before that there is even a moment where we are encouraged to reflect on the earlier scenes; were they duplicated from the cartoon only as a test point, and will the final scenes throw a surprising curve ball at us? But then the movie retreads right back to its formulaic course, even down to the inevitable confrontation of Gaston and the Beast in the towers of his castle after the townsfolk have arrived seeking vengeance against his very existence. Bill Condon was once a terrific filmmaker with great human stories at his disposal – both “Gods and Monsters” and “Kinsey” remain benchmarks – but over time he lost is way in the fog of conventional formula pictures, culminating in two contributions to the terrible “Twilight” series. Only “Mr. Holmes” from two years prior left one with the sense of renewed enthusiasm; it was as if the perceptive eye once at the helm of his early works emerged from a long slumber. Though his sense of style ought to have suggested something more original for the likes of this story, he is too weighed down, I think, by the influence of his management. He is not a director here, but a cameraman enslaved by the Hollywood influence. And yet “Beauty and the Beast” did make waves at the box office, going so far as to become one of those elusive billion-dollar films. For all intents and purposes, the studio made a picture that accomplished exactly what was desired, which was to earn some cash on the wistfulness of adults who loved the cartoon and wanted to expose their children to a more current retelling. What those kids are seeing, unfortunately, is an inferior, without the charm or humor to enforce the necessity of its creation. Perhaps some adults have lost the ability to tell much difference. I know enough about the Disney legacy to call a spade a spade.